The scientists at Max Huber Research Labs know that Asian women have highly refined skin. Their skin cells are perfectly aligned and exceptionally close together, creating a completely unique surface. Especially delicate and thin, their skin is more vulnerable to environmental influences that lead to discoloration, spots and uneven tone. To address these concerns, the Max Huber Research Labs created Blanc de la Mer The Brightening Collection - a scientifically advanced three-product regimen engineered with potent yet gentle naturally derived ingredients that work in synergy with Crème de la Mer to give skin back a youthful translucence. Introducing The Brightening Lotion Intense, The Brightening Infusion Intense and The Brightening Essence Intense. The Brightening Collection builds on La Mer’s heritage of healing. The story of the Miracle Broth™ and the legendary Crème de la Mer is one of hope and perseverance, meticulous science and the restorative powers of the sea. It is a story of daily transformation and profound healing that began with an accident and ended with a miracle. Half a century ago, aerospace physicist Dr. Max Huber suffered burns in a laboratory accident. Neither medicine nor science offered the benefits Dr. Huber sought, and he began a personal quest to transform the look of his skin. 12 years passed. 6,000 experiments were conducted. Finally, he perfected the precious, nurturing Miracle Broth™, which he incorporated into Crème de la Mer, the very first La Mer formula. “The secret to the collection’s unprecedented brightening and hydrating action comes from the legendary Miracle Broth™ in combination with a potent blend of proprietary ferments. Grey, red and brown “veils” of discoloration appear lifted, one by one, to reveal a crystal clear complexion,” explains Loretta Miraglia, Senior Vice President of Product Innovation. The gentle but highly effective Smoothing Ferment™ in The Brightening Lotion Intense and The Brightening Essence Intense helps rid skin of grey dullness and improve tone by accelerating exfoliation. Formulated with Laminaria Saccharina, a variety of brown kelp, it enhances skin’s natural cell turnover and helps visibly tighten pores without irritation or dryness. Skin’s surface is smoothed, refined and prepared to receive the benefits of the Blanc de la Mer Brightening regimen. Redness caused by environmental irritants is soothed by The Miracle Broth™— La Mer’s signature seaborne ferment, while the anti-oxidant properties of our exclusive Lime Tea extract help protect against future irritation. Finally, stubborn brown spots caused by hyper-pigmentation appear diminished by The VibraWhite Ferment™ Blend, a powerful combination of the Micro White Ferment, White Algae Ferment, and White Nutrient Ferment. The Micro White Ferment is formulated with red micro algae. The White Algae Ferment, helps soothe skin to help protect skin against future discoloration. For extra brightening benefits, The Brightening Lotion Intense and The Brightening Essence Intense contain The White Nutrient Ferment which harnesses the power of Vitamins C and E to dramatically reduce the look of existing spots. Together with the Miracle Broth, The VibraWhite Ferment™ Blend helps to fade the appearance of existing spots and restore skin’s purity. Deconstructed Waters™, an exclusive delivery system, enhances the effectiveness of the formula’s active ingredients and allows for deep hydration. Negatively charged “I” water penetrates the skin quickly and effectively to deliver hylauronic acid fragments into the skin’s cells. Known for its ability to bind water to cells, hylauronic acid provides immediate and lasting hydration. Positively charged “S” water conditions the skin to allow active ingredients to float on its surface, maximizing their potency. This intense hydration washes away dryness and opaqueness, to reveal soft, soothed skin. Tourmaline, a precious gemstone, is included in the formulas to bring skin a new luminosity and clarity. The primary colors of spectral light that are emitted from red, blue and green tourmaline gemstones are combined to create white light. This white light magnifies ambient light and creates a halo effect on the skin for a beautifully flawless look. The Brightening Lotion Intense is a critical first step in the complete Blanc de la Mer ritual that combats the look of dark spots caused by hyper-pigmentation and enhances the performance of the products that follow. The Brightening Lotion Intense harnesses the transformative powers of the sea and La Mer’s proprietary bio-fermentation process. The secret to its strong brightening and hydrating action comes from the legendary Miracle Broth™, in combination with an exclusive Smoothing Ferment™ and an ultra-potent VibraWhite Ferment™ Blend. To use: After cleansing, moisten a cotton pad with The Brightening Lotion Intense and gently press onto skin to infuse vital ingredients and prepare skin to receive the benefits of the Blanc de la Mer regimen. For optimal brightening, use twice a day with the complete Brightening Collection regimen and a La Mer moisturizer of choice. This potent, highly effective sea gel targets the look of dark spots and boosts the benefits of the Brightening Essence Intense. It calms, soothes and helps protect the skin from environmental stressors that can lead to the appearance of premature aging. The Brightening Infusion Intense utilizes a unique delivery system that releases a flood of activity upon application. A Smart Sea Gel interacts with skin’s temperature to effectively deliver key ingredients to help visibly improve skin instantly and over time. To use: Smooth over face and neck with fingertips. For optimal brightening, use twice a day and follow with The Brightening Essence Intense. This gentle yet highly effective serum delivers powerful brightening and anti-aging benefits. The VibraWhite Ferment™ Blend along with The Smoothing Ferment and a powerful Youth Ferment soothe irritation, repair visible damage and fade the appearance of age spots and uneven skintone. With the nutrient-rich Miracle Broth™, the heart of La Mer’s profound powers of transformation, pores are visibly diminished, skin looks clear, translucent, more lifted and firmed. To use: Smooth a small amount over face and neck. For optimal results, follow with your Crème de la Mer moisturizer. 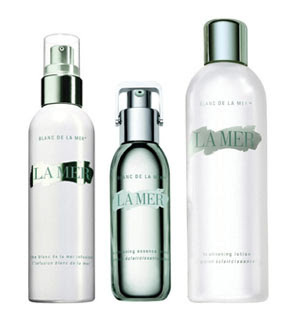 For optimal results use with the complete Brightening Collection regimen and your La Mer moisturizer. Blanc de la Mer The Brightening Collection has been formulated for delicate Asian skin to help dramatically reduce the look of age spots, lift dullness and hydrate deeply. Skin looks firmer, refined and polished to an impeccable clarity. Blanc de la Mer - The Brightening Collection will be available from April onwards, alternatively you pre-order from Sacks. Is this a new version of the Whitening Collection?